The Stylish Studio: Share the Link Love: Hold On! Share the Link Love: Hold On! 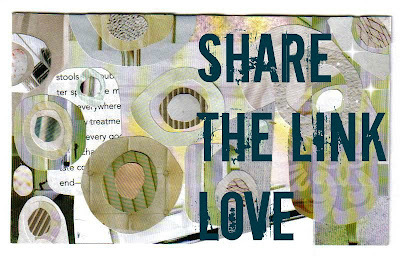 My collage of magazine cut out circles on a 3x5" index card. I'd love to share these links with you for this week in April. Index Card a Day was my first, and and still is, my favorite art challenge. Daisy Yellow courses and challenges I've participated in. "Brand Strategy for Bloggers and Artists." I'm a member of this course, and it rocks! Check out my CV page above for some creative blogging courses and blogging resources. has something funny writing going on about procrastinating and income taxes. Debra, thank you for following this website and commenting on my work. Glad you found me! Alabama Shakes on Saturday Night Live, April 20th. Musical geniuses they are. Mesmerizing! ~Cheryl Gee appreciates your comments and just adores new followers. That's Always, alright!